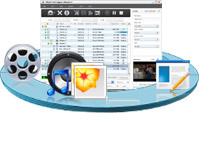 Full DVD Ripper Free is a powerful DVD ripping software application to rip and convert DVD movies to almost all video and audio formats (rip DVD to AVI, DVD to MP4, DVD to MPEG, DVD to WMV, DVD to DivX; convert DVD to MP3, DVD to WMA) with high DVD ripping speed and exceptional quality. 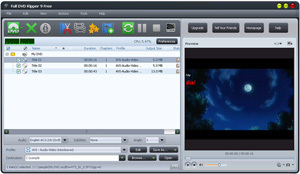 You can now enjoy your entire DVD collection on multimedia players such as iPod, iPad, iPhone, Apple TV, PSP, PS3, BlackBerry, iRiver PMP, Windows Mobile phone, Xbox and mobile phones all made possible with the Full DVD Ripper Free! 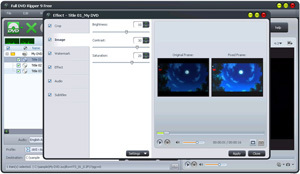 Full DVD Ripper Free also features video or audio-editing options prior to ripping - cut certain clips, merge several clips into one with transitional effects added, crop selected scenes, add subtitles and soundtracks and attach watermarks. 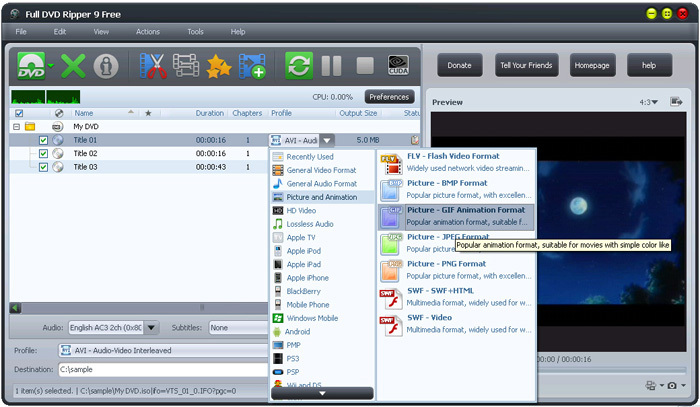 Other features include setting the target file size before conversion; running Full DVD Ripper Free in the background to save resources; and even setting an action (shutdown, exit, standby or hibernate) to auto perform after a task is done. Rip DVDs to AVI, MPEG-1/MPEG-2/MPEG-4, WMV, DivX, MP4, H.264/AVC, RM, MOV, M4V, XviD, 3GP, VOB, FLV, SWF; convert DVDs to HD videos: HD AVI, HD MPEG-2/4, HD H.264/MPEG-4 AVC, HD WMV, HD Quick Time, HD VOB, HD ASF, etc. 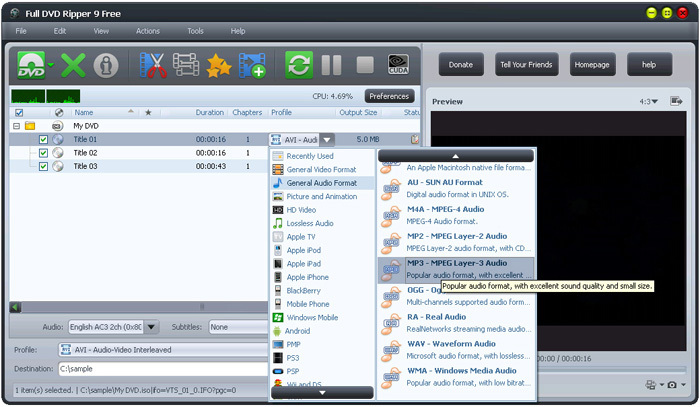 Extract audio from DVDs and save them as MP3, WMA, WAV, RA, M4A, AAC, AC3, OGG, AU, etc. 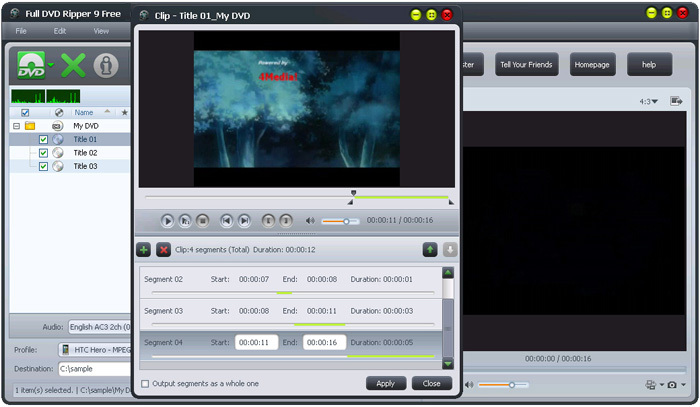 Set an interval and capture pictures from a DVD movie in batches or take snapshots while previewing and save them as BMP, JPG, PNG or GIF image format. 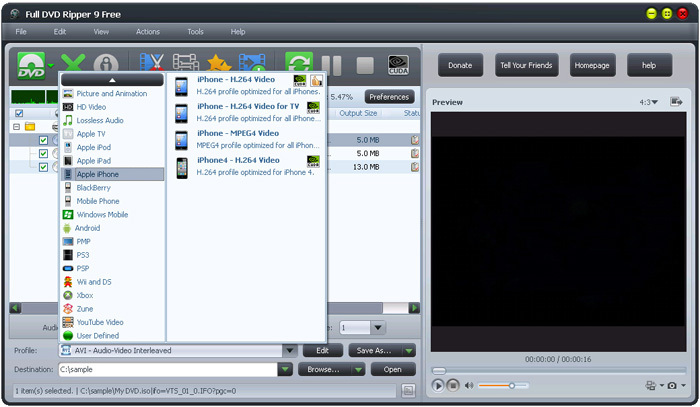 Watch DVD movies and videos on any player: iPod, iPhone, Apple TV, PSP, PS3, Xbox, Zune, NDS, Wii, 3GP mobile phones, Windows Mobile devices, PMPs, plus many others. Transfer converted files to iPod, iPhone and PSP directly after ripping DVD. Clip a title/chapter to extract the desired segments and optionally merge them into a new title/chapter. Merge several titles/chapters into one; insert transitional effects in between. Split a title/chapter into several chunks accordingly so you can fit it onto your multimedia device. Cut off unwanted borders from a video frame to feature a highlight. Adjust the image brightness, contrast and saturation. 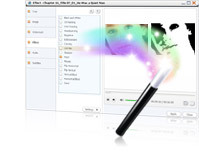 Create special effects such as "Black and White" and "Old Film". 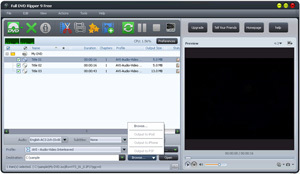 Add up to 8 subtitle files; adjust subtitle delay to sync it with the video. Add up to 8 audio files; adjust soundtrack delay to sync it with the video. 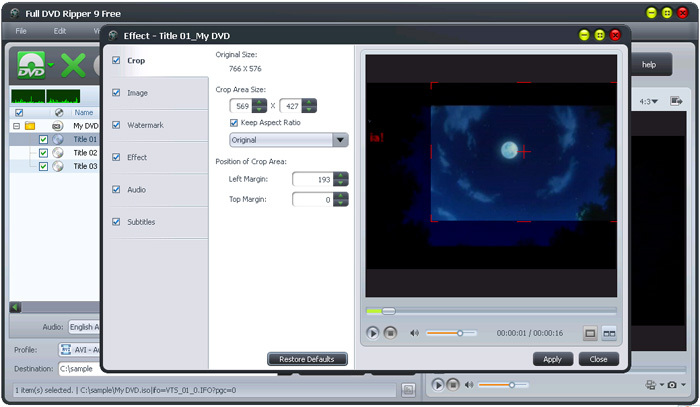 Personalize your video with watermarks (picture or text) and add copyright to avoid piracy. Preview the original file and the edited version side-by-side for easy comparison. A selection of conversion profiles with optimized parameters are available for a wide range of multimedia devices; create new profiles by customizing existing ones. 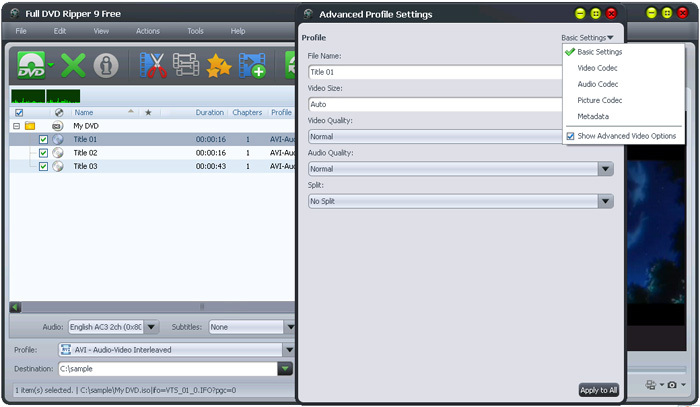 Select multiple output formats for a DVD title or chapter, or clone a DVD title, then set several output formats and rip them all in one go. 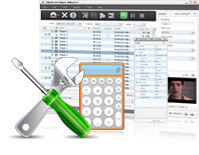 Get the output file size precisely by calculating the corresponding video bit rate using the Bitrate Calculator. 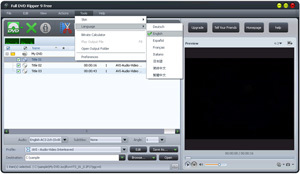 Parameters are grouped by video, audio, picture and tag, enabling you to change them more conveniently. 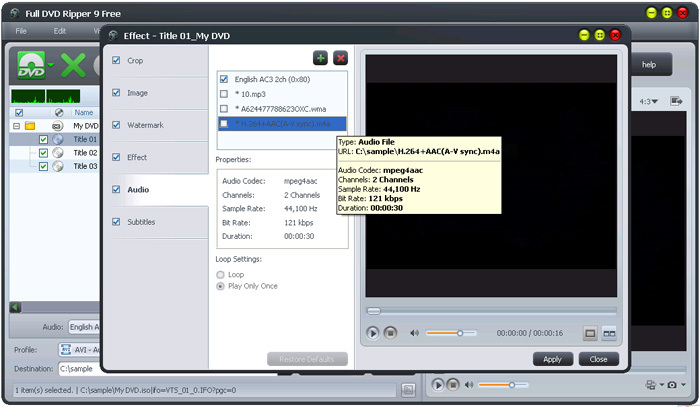 Convert multiple DVD titles/chapters to video and audio files with the highest conversion speed offered. 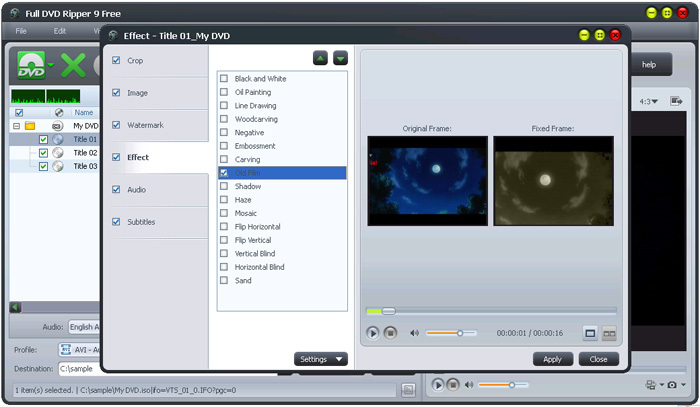 Auto retrieves DVD information from the Internet; enrich your DVD library with information such as artist name, DVD cover, DVD chapters and titles and more. 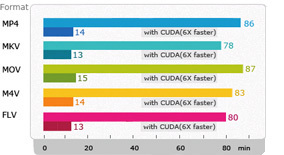 Multi-core CPU support maximizes conversion speed; comprehensive video editing features; user-friendly interface. 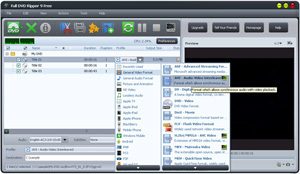 Manage system power; preview videos with the resizable built-in player and take snapshots during preview; Run tasks in the background; set application to auto exit or auto shut down, hibernate, stand by the system after a task is complete; view file properties; display file list in selected columns; change interface language to English, French, German, Spanish, Japanese or Chinese; many other features. All known DVD copy protections, like CSS, CPRM, CPPM, RC, RCE, APS, UOPs, ARccOS, RipGuard, FluxDVD, CORE X2, etc are removed. Thus, any DVD can be ripped. 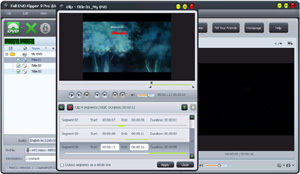 Video Rip and convert DVD movies to AVI, MPEG-1/MPEG-2/MPEG-4, WMV, DivX, MP4, H.264/AVC, RM, MOV, M4V, XviD, 3GP, VOB, FLV, SWF and many others. 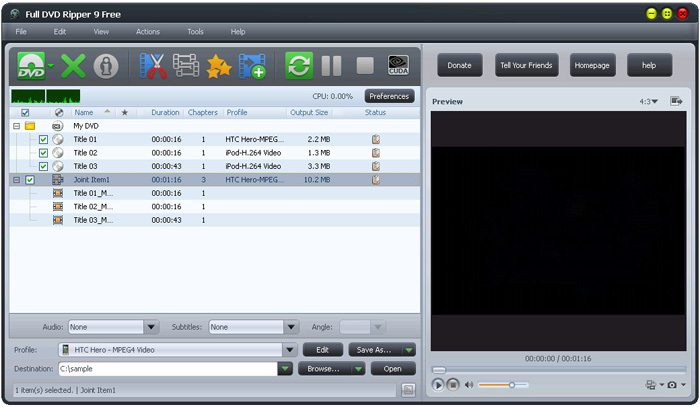 AVCHD Video Convert convert DVDs to HD videos: HD AVI, HD MPEG-2/4, HD H.264/MPEG-4 AVC, HD WMV, HD Quick Time, HD VOB, HD ASF, etc. I've never expected a video converter could output such a high quality files. But Full DVD Ripper Free does really converter videos beautifully, I personally love the cool and friendly interface that Full DVD Ripper Free provides. 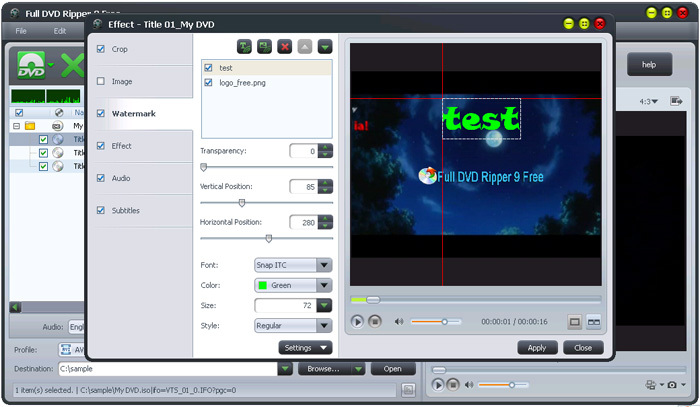 Full DVD Ripper Free is an excellent video converter, with batch video conversion, it could convert videos very quickly and easily. I was in a hurry to India for business meeting while all of my presentation materials (mainly meeting videos) were on my hard drives. This video converter help me to convert lots of the materials into my ipod in just a few minutes, trim video for me and made me preview all the stuff during the flight. So I had made to get myself ready and on time. Having a few favorite clips on my DVR, desktop, PSP and iPhone, I realize I really need a software that could easily and quickly convert them into the format I want. Got a free trial of Full DVD Ripper Free and then decided to purchase it, now I’ve been using it for almost half a year and I’m sure I would continue to use it, for it seems like it could convert all video files into any formats, sounds convenient and economical for me. © 2003-2015 | Full DVD Ripper Inc. a Multimedia Utility Company. All Rights Reserved.